Be a professional bartender at your own house with "Special Touch"
USE YOUR PROFESSIONAL COCKTAIL SPOON AND ENJOY OUR TIPS TO MIX THE ULTIMATE GIN & TONIC, COMBINING EVERY BOTANICAL WITH THE BEST-KNOWN GIN ON THE MARKET! Malaria Bitters will lift your gin and tonic to a higher level! Manuel Wouters selected a composition of Peruvian Kina and different kinds of citrus peel . 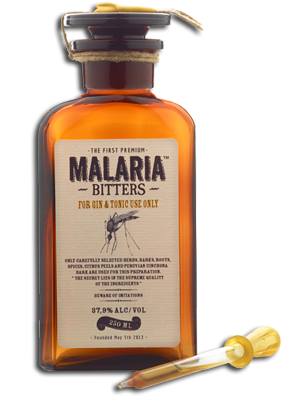 Malaria Bitters are used for gin and tonic . Use the dropper to dose at your taste!